The twelve Mexican political prisoners seized in the aftermath of the 2006 Atenco uprising have been released following a sensational high court ruling. 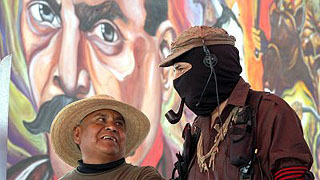 Judges ruled that not only was there no evidence to sustain the prosecution’s case but also that the charges the twelve faced – organised kidnapping – didn’t even exist in Mexican law. The announcement of the ruling led to an impromptu town festival, while hundreds of locals and activists established a vigil outside the prison holding Ignacio del Valle Medina, Felipe Álvarez and Héctor Galind. There, they waited for the release of the prisoners behind a giant banner proclaiming “Welcome, compañeros, to your town”.